Charles Montgomery at TEDx Vancouver. 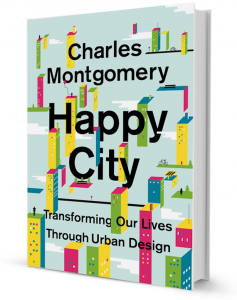 Copies of Happy City: Transforming Our Lives Through Urban Design by Charles Montgomery are available to borrow from the Pollard Memorial Library. Start a book discussion of your own with your friends, family, neighbors, or co-workers. Or come to the Non-Fiction Book Club discussion on September 8th @ 6:30PM in the Pollard Library ground floor meeting room. The books content and events are for readers of all ages! Pollard Library Meeting Room, 401 Merrimack St.
Panel discussion moderated by Richard Howe, Jr. featuring tour guides from his Lowell Walks series. For the past two summers, Lowell Walks tours have featured topics from Lowell’s past, present and future. The tours are all led by local experts in the given subject areas and have routinely attracted 100+ participants. Conviviality, shared spaces, a strong sense of place, and equal modes of transportation are things that have the potential to make city dwellers happier—Lowell Walks is both a symbol of and a catalyst for marked increase of all these measures. Kick back and enjoy world class chamber jazz duo dedicated to performing poetry that has been set to music. This multi-media performance includes an accompanying slide presentation with each poem projected on the screen. Luna Theater, Mill. No. 5, 250 Jackson St.
Urbanized is a feature-length documentary about the design of cities, which looks at the issues and strategies behind urban design and features some of the world’s foremost architects, planners, policymakers, builders, and thinkers. Who is allowed to shape our cities, and how do they do it? By exploring a diverse range of urban design projects around the world, Urbanized frames a global discussion on the future of cities. (2011) NotRated | 85 min. Join us for a good old fashioned block party featuring food, folks and fun. Activities for kids, plus an outdoor family friendly movie at sundown.